Hello again, fellow Buddyfighters! 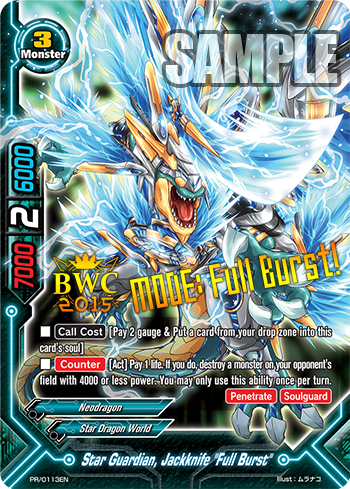 Fresh from last weekend’s Future Card Buddyfight episode, we are bringing you the excitement right here on Buddyfight Buzz! Today’s article will be introducing all the different forms of “Star Guardian, Jackknife”!! For those who have yet to catch up with the latest episode, what are you waiting for, check it out right here!! The light that cuts a path to the future! Edge of the soaring star!! Buddy of Tasuku, “Jackknife Dragon”—formerly from Dragon World—has evolved into “Star Guardian, Jackknife”, now from Star Dragon World. For those who have been closely following the anime, you would know that he has been out of action for a while… but no longer! Role shift, variant form! All devices engaged! FCS active!! The future form of Jackknife! 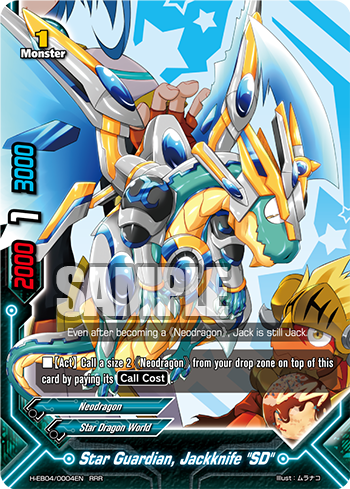 Granted powers from the future, this evolution of Jackknife is his basic 《Neodragon》 form! 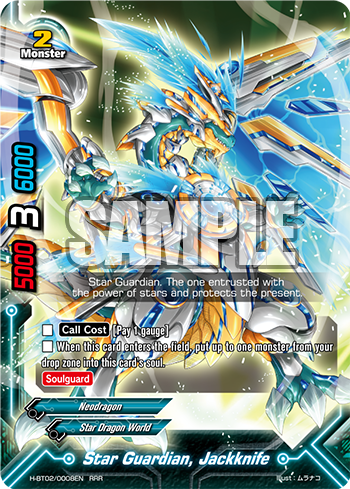 As a 《Neodragon》 with [Soulguard], it is not only able to defend itself with a relatively high defense of 6000, it also has [Soulguard] to boot! Offense-wise, it is an average with 5000 attack power, but with 3 critical, it is a relatively aggressive card! With an arsenal of Dragonarms, become a guardian that is capable of everything!! Welcome this brand new form of Jackknife in Hundred Extra Booster Vol. 4: Buddy Allstars+!! It is the super deformed form of Star Guardian Jackknife; looks extremely small, but is actually extremely powerful!! Not only you can call any Jackknife on top of this card, you can even put other size 2 《Neodragon》 monsters from your drop zone such as “Sixth Omni Storm Lord, Variable Cord”!! Currently the only size 3 form of Star Guardian Jackknife. It is not only high in power, but possesses the [Penetrate] ability as well! With [Soulguard] and a decent 6000 defense, it will surely be on the field for at least a couple of turns. With an ability to simply pay 1 life to destroy any monster with defense 4000 or below, even on your opponent’s turn, stop those monsters with low defenses in their tracks!! Another Jackknife to be included in Hundred Extra Booster Vol. 4: Buddy Allstars+! Indeed, it is slightly more expensive than “Star Guardian, Jackknife” to call, but it has the option to call out a size 0 or 1 《Dragonarms》to the field. This will allow you that small extra push to finish off your opponent! Jackknife, “Superior Plasma” is released in two colors for this new extra booster, so be sure to check both versions out! BECOME THE STAR OF HOPE!! An all-powerful Jackknife dragon! Firstly, this latest form of Jackknife is able to build upon the strength of previous Jackknife monsters when it is put on top of them. Besides that, it also holds other potent abilities: when this card is on your field, you cannot be dealt damage by effects from your opponent’s cards, and items on your field cannot be destroyed!! This card protects the fighter from almost all spells, abilities, and even impact cards!!! The ultimate shield has arrived!! 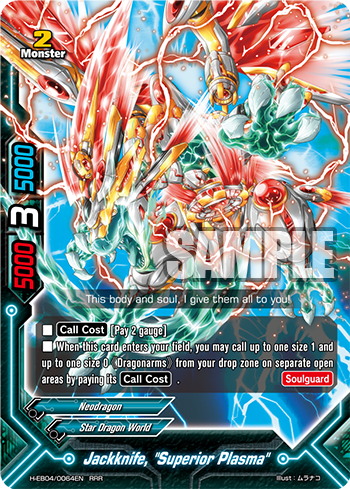 Not only that, if there are 《Dragonarms》 in its soul, this card is impervious to destruction by the opponent’s effects during the opponent’s turn!!! Psssst.. this brand new card will only be available in the soon-to-be-released Hundred Booster Pack Vol.4: Mikado Evolution! Will you be able to draw out the savior?! But wait, that’s not all!! New forms of Jackknife are joining the line-up as they are being exclusively released at events next year! 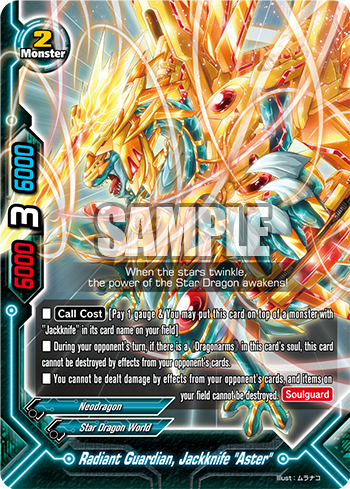 “Jackknife, “Overwrite”" and “Fifth Omni Blade Dragon Lord, Jackknife “Emperor”" (though not from Star Dragon World) are but two of them. 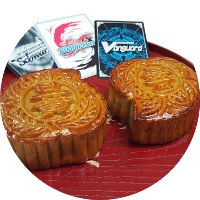 With all these forms, and future forms of Jackknife dragon, your future is guaranteed to be a radiant one.